I often get a random taste for something that I just can’t shake. This was the case earlier this week when I decided that I HAVE To have spinach-artichoke dip. Of course, I didn’t even have any artichokes and the frugal streak in me wouldn’t let me go to the store and buy the ingredients. If I was going to satisfy this craving, I was going to have to do it with what was in the house. So, as with most of my recipes, this recipe should really be titled (Here’s What You Do When You Don’t Have The Right Ingredients To Make) Spinach-Artichoke Dip. The key was finding the “magic” with the standard recipe and making sure I, at least, had the right ingredients to recreate that magic. 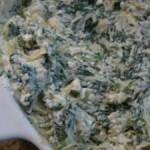 It turns out the special flavor in spinach-artichoke dip doesn’t come from the spinach or artichokes- its the cheeses and raw garlic! I know this because I tasted along the way and it was pretty blah until there was this big bang of flavor as soon as those items came together. The actual recipe below is for a pretty spinachy dip. It turned out to be more flexible this way and I used it as a dip, sandwich spread, inside a hamburger (Jucy Lucy), in an omelete, and as a small, low-carb side dish. In fact, it’s been almost a week and I still have some left that I’m working through slowly. I was thinking about stuffing the rest into mushroom caps and baking. YUM! Mix up the ingredients and microwave for a few minutes. Stop and stir about every 30 seconds until it’s mixed well. It doesn’t really need to be baked like many recipes but it would be nice placed in a ceramic dish, topped with some extra cheese and then broiled for a few minutes to melt the cheese. I really think the key ingredients are the cream cheese, mayo and garlic. The recipe above gives the classic taste minus the artichokes. If you wanted to turn this into the real thing, I would either use half the spinach and add a can of artichoke hearts, coarsly chopped. I think as long as you have cream cheese, mayo and garlic you can really spin off on some delicious and wild variations. I was thinking about adding some smoked paprika and chorizo for a Spanish flavor. Some raw vegetables like onions and celery might add a nice crunch as long as you don’t cook it too long. It would be tasty cold but you would probably want to add in some sour cream and cut back on cream cheese or else it would be too stiff.